The weight of a body is a familiar force. It is the force of the earth’s gravitation for the body. We will study gravitational interactions in detail in Chapter I: need some preliminary discussion now. The terms mass and weight are often and interchanged in everyday conversation. It is absolutely essential for you’ stand clearly the distinctions between these two physical quantities. to throw horizontally, but it would be easier to lift. So what exactly between mass and weight? question, according to legend, came to Newton as he sat under apples fall. 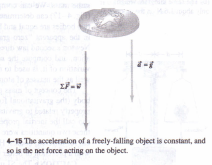 A freely falling body has an acceleration equal to g, second law, a force must act to produce this acceleration. If an acceleration of 9.8 mfs2, the required force has magnitude ‘” (I kg)(9.8 mfs2) = 9.8 kg- mfs2 = 9.8 N. makes the body accelerate downward is the gravitational pull of eight of the body. 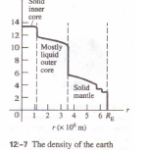 Any body near the surface of the earth that bas e a weight of 9.8 N to give it the acceleration we observe when generally, a body with mass must have weight with magnitude (4-9) a force, a vector quantity, and we can write Eq. (4-9) as a (4-10) magnitude of g, the acceleration due to gravity, so g is always a definition. Thus w, given by Eq. (4-9), is the magnitude of the positive. stand that the weight of a body acts on the body all the time, or not. When a IO-kg flowerpot hangs suspended from a chain, its acceleration is zero. But its weight, given by Eq. (4-10), is it. In this case the chain pulls up on the pot, applying an upward =2:F =,. of the forces is zero, and the pot is in equilibrium . its mass is still 1 kg (Fig. 4-16). 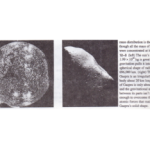 An 80.0-kg astronaut has a weight on (80.0 kg)(9.80 rnls2)= 784 N, but on the moon the stronaut’s weight would (80.0 kg)(1.62 rnls2)= 130 N. The following excerpt from Astronaut Buzz Aldrin’s book Men from Earth, his experiences during the Apollo 11 mission to the moon in 1969, 0 interesting insights into the distinction between mass and weight: Our portable life-support system backpacks looked simple, but they were on and tricky to operate. On Earth the portable life-support system and combination weighed 190 pounds, but on the moon it was only 30. Comb my own body weight, that brought me to a total lunar-gravity weight 60 pounds. One of my tests was to jog away from the lunar module to see how able an astronaut was on the surface. I remembered what Isaac N taught us two centuries before: Mass and weight are not the same. I wei 60 pounds, but my mass was the same as it was on Earth. Inertia was a had to plan ahead several steps to bring myself to a stop or to turn without failing.